This post contains my food diary entry from Friday. 2948 calories total: 91.1% from carbs, 6% from protein, 2.8% from fat. Breakfast – mango, pack grapes, smoothie made from mango, spinach, kiwi, kale, and water. Lunch – 2 packs grapes. Dinner – boiled potatoes, 2 bunches roast broccoli, pack mushrooms. In case you haven’t noticed, I love grapes! It looks like protein will never be a problem for me. 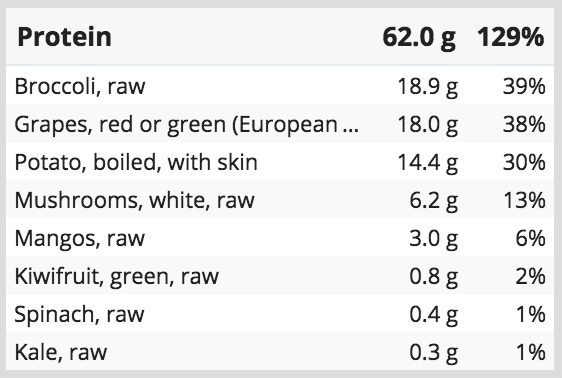 Two bunches of broccoli have as much protein as 5 packs of grapes. Fruits and veggies have all the protein you need. 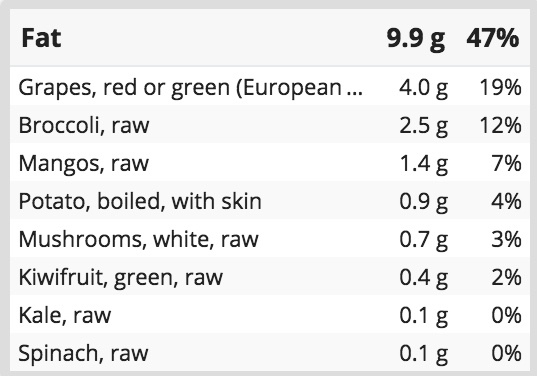 It’s interesting to see that I’m still consuming plenty of fat in my diet even though I avoid fatty foods like oil, nuts, and avocado. This lifestyle isn’t completely fat-free as fruits and veggies contain small amounts of fat and all these small amounts add up at the end of the day. 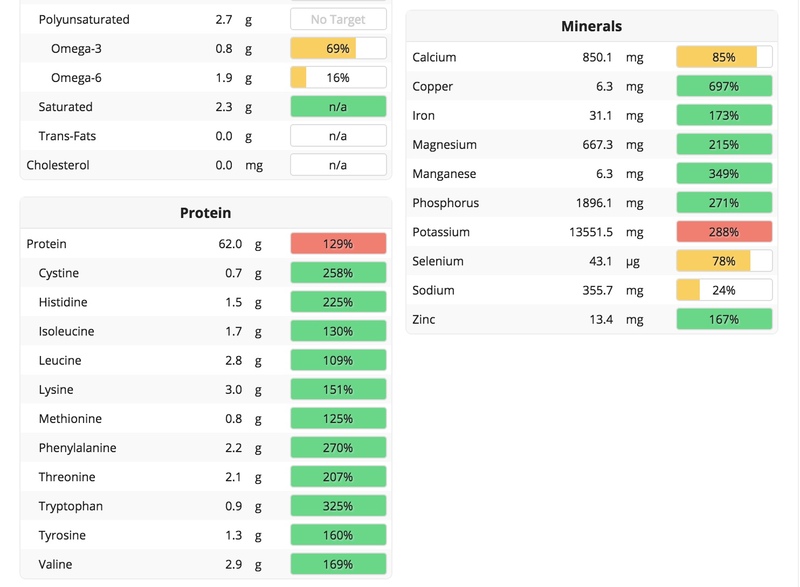 Most of my fat intake came from grapes and broccoli, which happen to be some of my favourite foods. I can’t survive without them! As a high carb low fat vegan, I aim to eat less than 10% of my daily calories from fat. Since I started tracking my food intake this week, I’ve learned that I eat between 2-3% of my daily calories from fat. 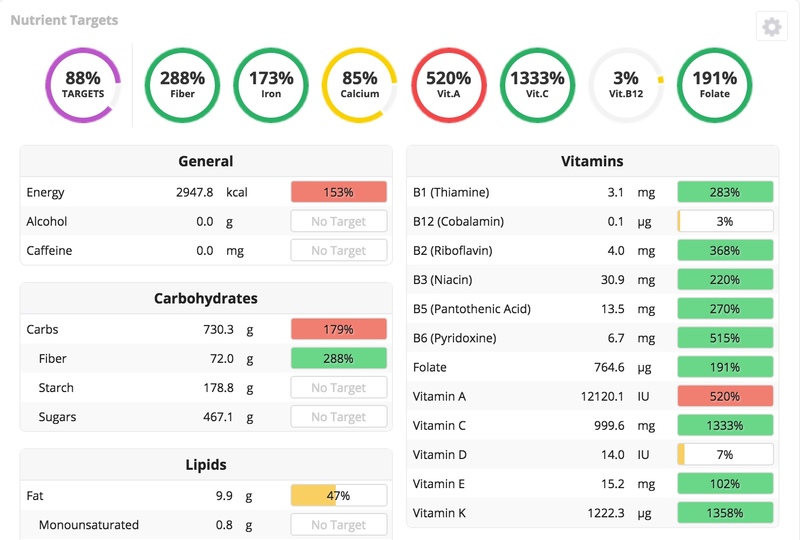 Do you track calories or nutritional information? What have you learned? 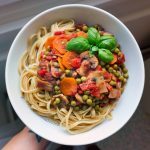 « What I eat in a day – Thursday.